This undated photo provided by the U.S. National Park Service shows toilet paper strewn throughout Death Valley National Park, Calif. National parks across the United States are scrambling to clean up and repair damage caused by visitors and storms during the government shutdown. During the 35-day government shutdown, some visitors at parks and other protected areas nationwide left behind messes and damage that National Park Service officials are scrambling to clean up and repair as they brace for the possibility of another closure ahead of the busy Presidents Day weekend this month. But interviews with park officials and nonprofits that help keep parks running revealed a toll from people and winter storms when workers could not make fixes quickly. "We're kind of ready to just have a bit more stability,'' said Angie Richman, a spokeswoman at Arches National Park in Utah. Elephant seals and their pups occupy Drakes Beach, Feb. 1, 2019, in Point Reyes National Seashore, Calif. 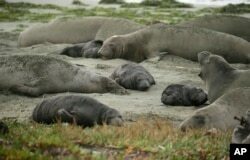 Tourists were unable to visit a popular beach in Northern California because it had been taken over by a colony of nursing elephant seals during the government shutdown. Grand Canyon officials said they have postponed a highly competitive lottery that awards permits for self-guided rafting trips on the Colorado River in 2020 because staff members have to catch up on other work. Matt Baldwin with the river permits office said the lottery was rescheduled for Feb. 16, which could change if another shutdown occurs. That could also lead the park to miss out on its main centennial celebration Feb. 26. At Southern California's Joshua Tree National Park, Superintendent David Smith said officials still were assessing damage Friday but at least one signature tree died when an off-road vehicle ran it over during the shutdown. It's not the same toppled tree from a picture distributed by the park service early in the shutdown that was used widely to illustrate the perils of understaffed or closed parks. Smith said several other Joshua trees, which can live hundreds of years, were damaged, including one that was spray-painted, but the park has yet to determine the exact number and when it happened. Someone also cut down a juniper tree, and off-road vehicles created extensive unauthorized trails, with wheel marks dug into the delicate desert soil nearly a foot deep in some spots, Smith said. 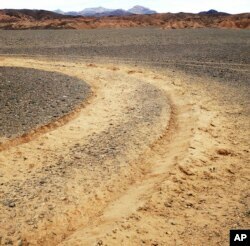 This January 2019 photo provided by the U.S. National Park Service shows vehicle tracks in an area of Death Valley National Park, Calif., that park staff say can leave a lasting trench. National parks across the United States are scrambling to clean up and repair damage caused by visitors and storms during the government shutdown. "It became pretty depressing, the kinds of things people will do when they are unsupervised,'' Blacker said. Visitors at Arches in Utah left human waste outside a restroom, stomped out five trails in a permit-only area that was shut down and damaged an entrance gate to allow vehicles to drive on snow-covered roads when the park was closed after a storm, Richman said. Campgrounds, visitor centers and trails that seasonal workers help prepare could face delayed openings, and families planning spring break or summer vacations might think twice about visiting if they don't think national parks are safe or fully staffed, said Phil Francis, chairman of the Coalition to Protect America's National Parks. "There are a lot of impacts that will be felt in the future that aren't being felt or even talked about now,'' he said. Meanwhile, the prospect of another shutdown looms. Elizabeth Jackson, a spokeswoman for Guadalupe Mountains National Park on the Texas-New Mexico border, noted the stress on workers.